The Stamford Observatory is a research facility used by members of the Fairfield County Astronomical Society. Most Fridays, weather permitting, visitors can enjoy viewing the moon, planets and deep space objects through the 22-inch research telescope. The telescope's drive mechanism and electronics have recently been replaced with modern high precision components. The computer control permits the operator to zero in on any object in the sky and the telescope then goes to that location automatically. Head to the Observatory on selected Friday nights to explore the night sky with talks on planets, stars galaxies and much more. Start by enjoying a presentation on a fun and interesting topic, followed by a visit to view the night sky through our 22-inch diameter telescope. This program is suitable for children ages 5 and up. For topics see our Calendar of Events page. 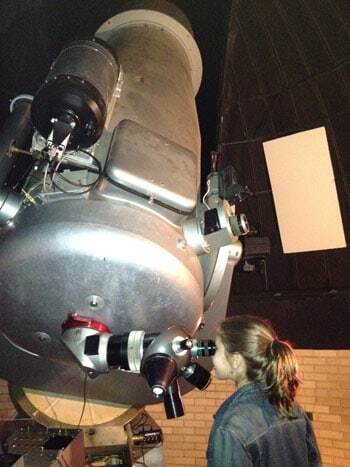 Our planetarium is open for school programs, scout groups, special events and private parties. Location: Behind the Heckscher Farm off Scofieldtown Rd. Enter from Scofieldtown Rd. GPS users enter - 151 Scofieldtown Road. Please call 203.977.6537 for weather updates in regards to telescope viewing. The Observatory will be closed on: 11/23, 12/21 and 12/28. The Observatory will close for the season on 12/14 and will reopen in March. Viewings are weather permitting. The observatory will be closed if temperatures drop below 21°F . Due to space limitations, organized groups are not permitted at public viewings or lectures. To schedule a group visit, call 203.977.6515.